November 8, 2003. Two new bounties, #7 (UAE intergration) and #8 (CD ISO Improvements) have been added to the TeamAROS Bounty list. Power2people agreed, that the bounty is completed, so I put a label v1.0 on Janus-UAE and released it at the AROS-archives. V1.0 is just a relabeled and recompiled v0.9, so there are no bug fixes/new features in there. I already received the bounty money, which leaves me to thank all donators. The money will be spent for our next family vacation. I've recently been looking in to the process scheduler linux uses. I found a good write up here:http://en.wikipedia.org/wiki/Process_scheduler which includes a list by kernel version. The process scheduler is different from the IO scheduler and much harder the change. AmigaWorld.net is a great place to learn about the Amiga. I often use that phase. I use it cause it is a good phase, simple but powerful. In gaming life I recently found my character dropped to 0 hit points. It was looking like a TPK (Total Party Kill) as I was the healer and being down makes it really hard to heal folks. So I was looking at my character sheet looking for a way out and noticed that my armor gave me resist 5 psychic. Turned out I took 3 points of psychic before the blow that took me to 0. This took more time, than I thought, but it might be a starting point for some people. 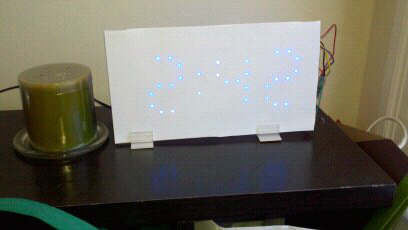 Finally built the clock I picked up at Makers Fair last year! Far more years ago then I care to remember I started playing D&D again with some friends. It started as a game once a month, then we started a regular Thursday night game and that Thursday night game is now on it's second campaign. Why "Court of the Universe" and why this blog? I chose to call my blog "Court of the Universe" after one of the locations of the 1915 PanAmerican worlds fair. I always liked the names people gave things in the past, they instilled a sense of grandeur simply by what they called it. In reality it was a temporary structure build of chicken wire and stucco but for the year it was around it raised the hopes and dreams of those who came to pay it homage. Built in a time when America was a raising force in the world, tucked on the wrong side to two oceans and the land of hopes and opportunities. p.bes: "What I need is JUAE able to load the configuration file, edit it with the gui, and then save it again with its name or another one choosen by the user."